Velimir Cvetkovic submitted a video of his nicely executed WiFi radio project to the forums. His project is based on my wifi radio project from 2008. At the heart of the radio is an Asus WL-520gU wireless router. Velimir wrote his own LCD display and channel selector firmware in BASCOM. His wooden case design is very similar to the one Tony and I built for the 2009 Bay Area Maker Faire. The Hexbright is an Arduino-compatible open source flashlight that was the subject of a very successful kickstarter campaign in 2011. Today I spent a short time working on some custom firmware for it. Button presses cycle between modes (low, med, high brightness) as usual, but if you wait longer than CYCLE_DELAY (default 5 seconds) between presses, the next press turns the hexbright off. If the hexbright is left on for longer than AUTO_OFF_MINUTES (defaults to an hour), the hexbright turns off. Handy for when you prop the light somewhere and forget about it. You can download my custom Hexbright Arduino sketch here. If you’re new to the Hexbright, read these well-written instructions first. You’ll need to install the required USB driver and Arduino board configuration file. 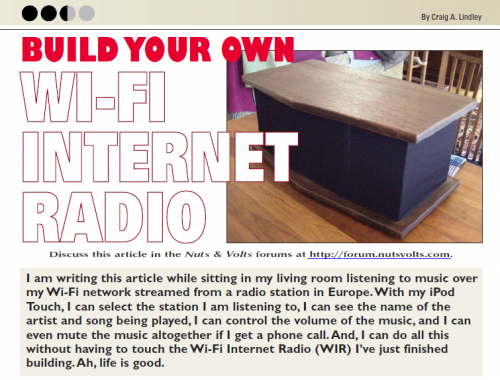 The March issue of Nuts and Volts features an article by Craig Lindley about how to Build Your Own Wi-Fi Internet Radio. 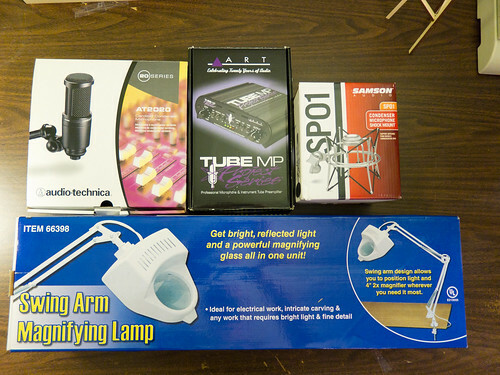 In the article, Craig mentions that my Wifi Radio project gave him the inspiration to build his project. Thanks for the shoutout, Craig! 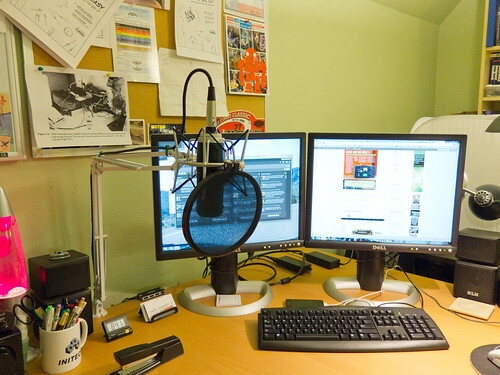 After being hassled by Chris about my audio quality on The Amp Hour for the past year, I finally broke down and upgraded my podcasting microphone setup. Here are some photos of the new setup and some notes about my approach. The closest IKEA is 40 minutes away, so instead I went to Harbor Freight Tools and bought the cheapest swing arm lamp I could find. 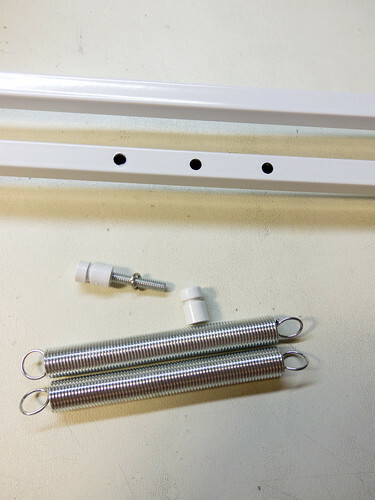 I removed the lamp portion (after you remove the adjusting knob, the shoulder-bolt can be removed and the lamp pulls out). 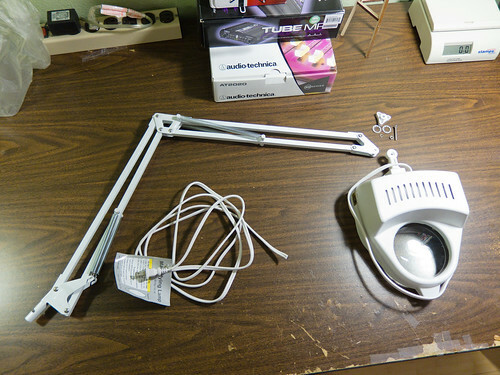 Then I cut the power cord and unthreaded it from the lamp. 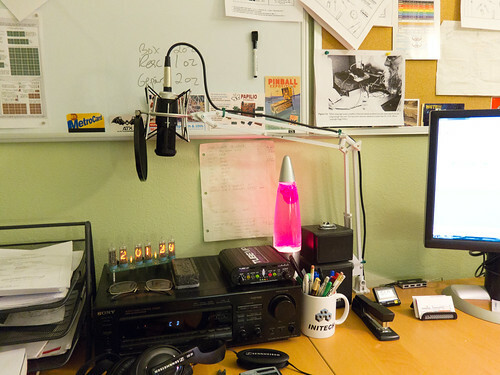 …including the desk lamp. I used a 1/4″ nylon spacer to fill the gap left by the narrow tab on the shock mount and some lock-washers to keep the mount from rotating when the adjustment is tightened. The original shoulder-bolt stripped (oops) so I replaced it with a beefier 10-32 bolt and corresponding nut. While my initial tests with just the AT2020 mic were promising, I found that the swing-arm sagged under the extra weight of the shock mount. To solve this problem, I drilled two extra holes at 1″ intervals from the original spring perch on the swing-arm. 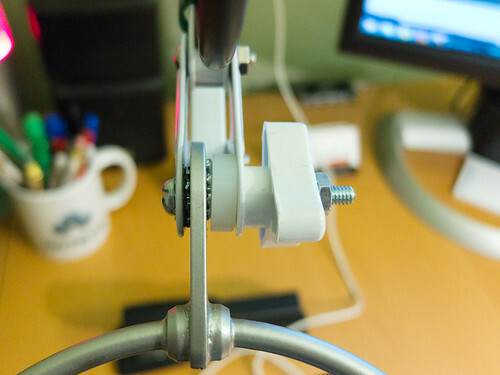 This allows me to adjust the spring tension to balance the arm. Now the mic stays where I put it. Here is the finished setup. 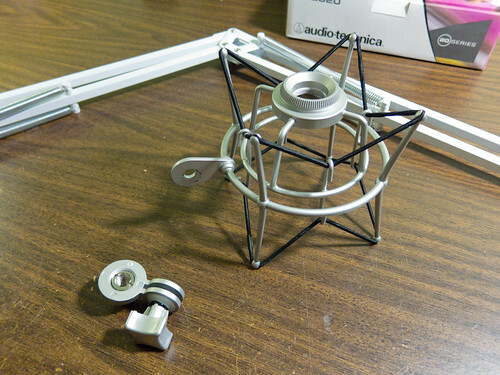 I removed the heavy bracket and gooseneck from the pop filter and zip tied it to the front of the shock mount. 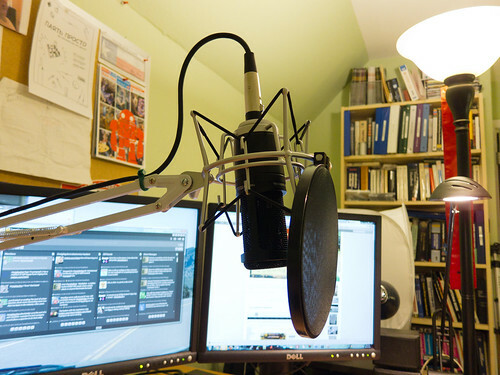 The spacing between the pop filter and the mic comes out just about right. Here’s the mic preamp. It’s got tubes! 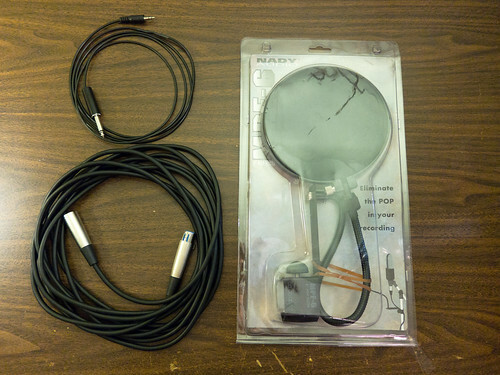 The microphone connects to the preamp through the XLR cable. 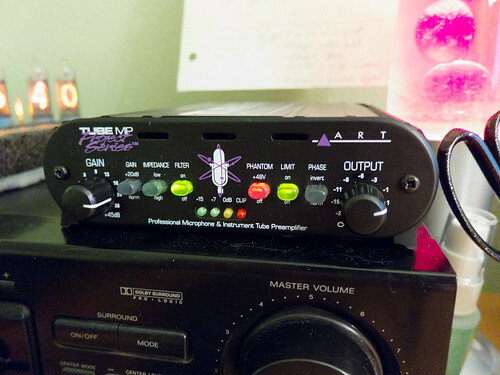 The output of the preamp is connected to my PC’s line input through the junkbox 1/4″ to 1/8″ cable. I’m really happy with the new setup, but you can judge it for yourself on this week’s episode of The Amp Hour (Xenomorphic Xerox Xebec).